On March 12, grab your Thin Mints and your proficiency badges, and get ready to celebrate — because Thursday day marks the 103rd anniversary of the Girl Scouts of the USA, the young women's organization founded by Juliette Gordon Low in 1912. Low, born in 1860, became a widow in 1905, and was looking to devote herself to a new project — one that would teach young women about their worth and inner resources. After initially working with a Scottish organization called Girl Guides and founding the first American branch of the group in 1912, Low decided to break away and further develop her young women's scouting association on her own. She soon changed the organization's name to the Girl Scouts, and became the organization's first president. Although she died at the age of 66, Low’s dedication to girls and women during her life changed our ideas about girlhood in America. Low never remarried or had children of her own, and gave the Girl Scouts everything she had. And 103 years later, the millions of women who learned skills, made friendships, and discovered themselves through the Girl Scouts have her to thank. To celebrate her legacy, here are eight things to know about Low, the Girl Scouts, and the ways they changed the world. On March 12, 1912, Juliette “Daisy” Gordon Low held the very first Girl Scout meeting in her hometown of Savannah, Georgia. Hoping to give girls the opportunity to grow physically, mentally, emotionally, and even spiritually, Low started the organization with just 18 girls in attendance at that first meeting. An active athlete and lover of the arts, Low wanted to teach young girls that they really could do anything, if they just stepped out of the roles that society had built for them as women. Low herself had suffered through a tumultuous marriage to a man who cheated on her and left most of his estate to his mistress; her passion for helping young women become self-sufficient seemed borne out of her own experiences of feeling circumscribed by the era's roles for women. Low wanted girls to realize that there was life outside what were considered the traditional “duties” of being a woman at the time. Low took the early Girl Scouts on camping trips, taught them about first aid and astronomy, and even had them play basketball ― things that not too many women got to learn about at the time. She encouraged them to learn about science and math, and even pursue professional careers. She wanted to create generations of women who would be resourceful and not have to rely on others for help — in the days before women even had the right to vote. While cookies are a huge part of how the Girl Scouts raise funds for their troops today, it wasn't initially part of the plan for how the organization would function. In 1917, while trying to make money for a group project, the Mistletoe Girl Scout Troop of Muskogee, Oklahoma became the first troop to bake cookies and sell them as a fundraiser. Other troops followed their lead, and in 1935, troops began to sell commercial Girl Scout cookies. Of course, back then, they were just selling them at school, as opposed to door-to-door and online (or outside marijuana dispensaries). The Girl Scouts of America were very involved with the war effort back home during both WWI and WWII. From selling war bonds, to collecting peach pits for gas masks (they were used as filters), to working in hospitals, Girl Scouts provided hands-on support to the country and the troops. During the 1930s, when the Great Depression hit, the Girl Scouts again stepped up to the plate, collecting clothing and canned goods for the poor, making them quilts, providing meals for impoverished children, and helping out at hospitals. 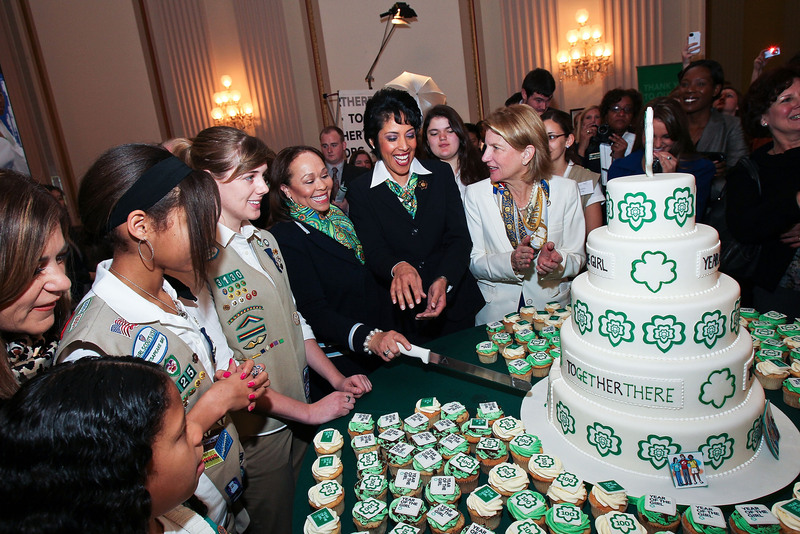 Although Low decided to start the Girl Scouts after meeting Boy Scouts founder Sir Robert Baden-Powell in 1911, the two organizations are in no way affiliated. In fact, they couldn’t be more different, especially when it comes to ideas about inclusivity. The Girl Scouts, from the very beginning, welcomed all girls to join, regardless of race or financial background, and in the 1930s, published all their resources in Braille, so no girl would ever have to feel left out of the Girl Scouts experience. While the Boy Scouts only lifted their ban on African American scouts in 1974 after pressure from the NAACP, the Girls Scouts desegregated troops in the 1950s; The first African American National Girl Scout President, Gloria D. Scott, took office in 1975. Low, who became deaf after an accident, firmly believed that every girl who wanted to be a Girl Scout should be and welcomed all, including girls who had disabilities, who were often isolated from their peers in that era. In keeping with Low’s original vision of the Girl Scouts as a place accepting of all girls, a Colorado troop became the first troop to admit a transgender girl in 2011, citing that anyone who identifies as a girl is welcome to join. Although an ignorant group of haters tried to initiate a cookie boycott after this decision, neither the troop, nor the Girl Scouts, backed down. In the 1920s, the Girl Scouts branched out to include American girls living abroad in China, Mexico, Saudi Arabia, and Syria. Today, the organization has 10 million girl and adult members in 145 countries. In the United States alone, there are over two million active Girl Scouts, and more than 59 million American women have been Girl Scouts since the organization's inception in 1912.